This is a 5-night, 6-day workshop. Your adventure begins at 10 a.m. on January 29 and ends after a final slideshow on the afternoon of February 3. $1,995 + applicable taxes. Apply below. Note: Deposit of $500 is required to reserve your spot at the workshop. Balance of $1,495 is due on October 31, 2017. Or, you may choose the "Pay in full" ticket if you desire to pay all at once. Last day for a cancellation request is October 30 (see details here).The workshop fee does not include transportation to and from the park, food or the park admission fee. 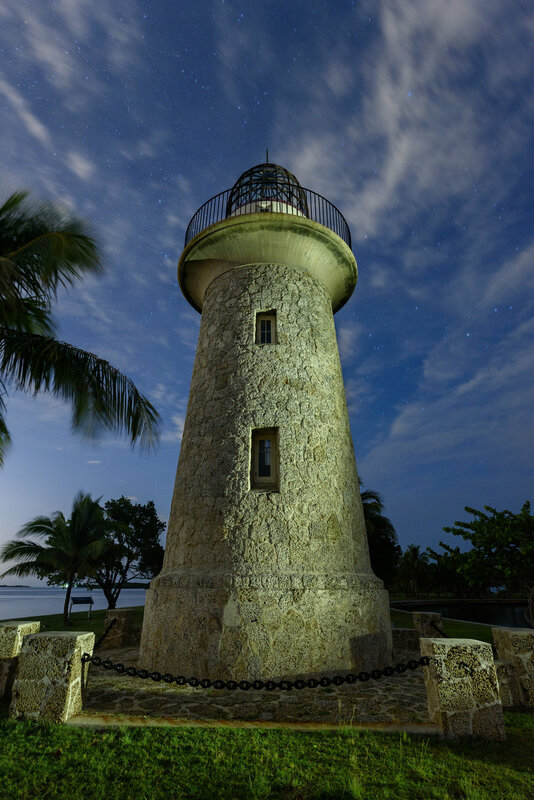 There is over 10,000 years of human history in Biscayne National Park, from pirates and shipwrecks to pineapple farmers and presidents. We are working very closely with the rangers of Biscayne, as well as partnering with the Biscayne National Park Institute, to offer you an incredible wealth of knowledge as well as exclusive access to some of the most unique places in the park. Be one of the first people to capture this waterworld at night. We strategically planned this workshop during a Super Blue Moon and in a place that offers a warm respite from most of our cold winters. This also means an early start to the evening with most of our adventures beginning at 4 to 5 p.m. and ending around midnight. We are starting the workshop a couple of days before the full moon and will have several options to “Shoot the Moon” as either crater-liscious shots or moon trails rising from the sea to the sky. 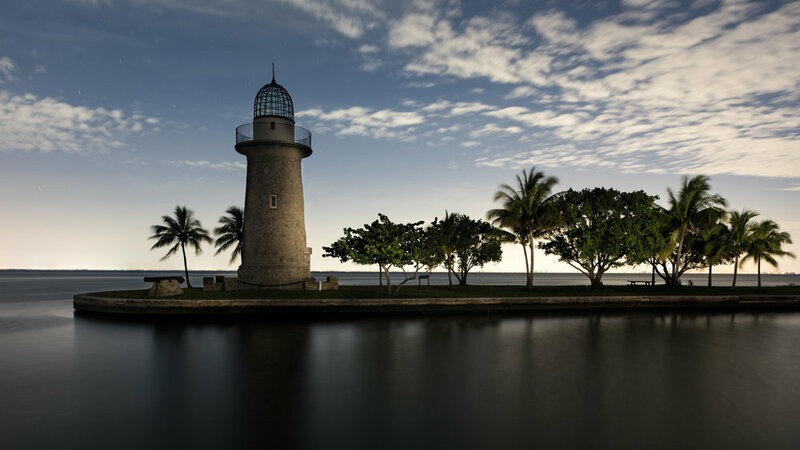 We will base our operations in the historic town of Homestead, Florida, just 15 minutes from Biscayne. However, most of our time in the park will be spent on boats provided by the Biscayne National Park Institute. Our trips will take 30 to 45 minutes to reach our destination within the protected bay. Boca Chita Key. Home to Honeywell’s beautiful ornamental lighthouse and chapel which were built in the 1930s. This key is the crown jewel in the park and we’ll have access to go inside the lighthouse as well as shoot along the small beaches and mangroves. 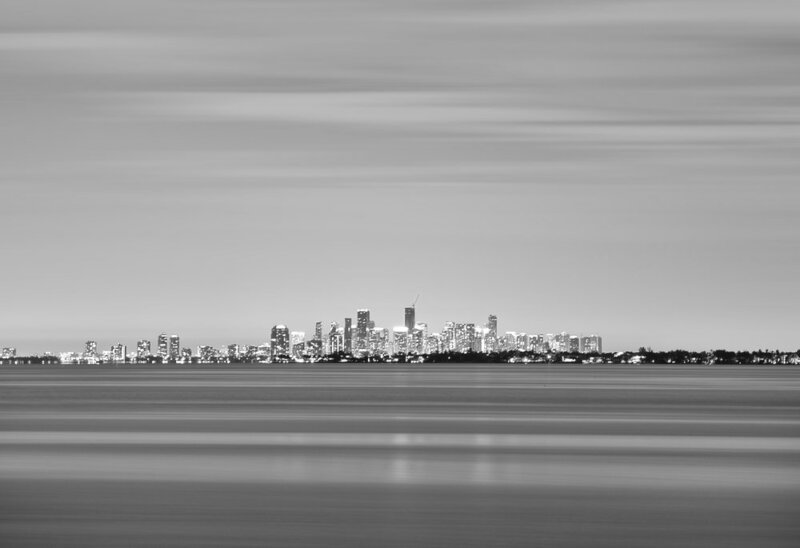 You can see the skyline of Miami in the distance, so bring a telephoto lens and play the palm trees and pilings against the city lights. Stiltsville. We are absolutely thrilled to be working with the Stiltsville Trust and offer our students extraordinary access to this unique location. Floating like a dream less than a mile from Key Biscayne (and a few miles south of Miami proper), these 7 houses offer a rich and lawless history, as well as spectacular views of each other hovering between the water and sky. 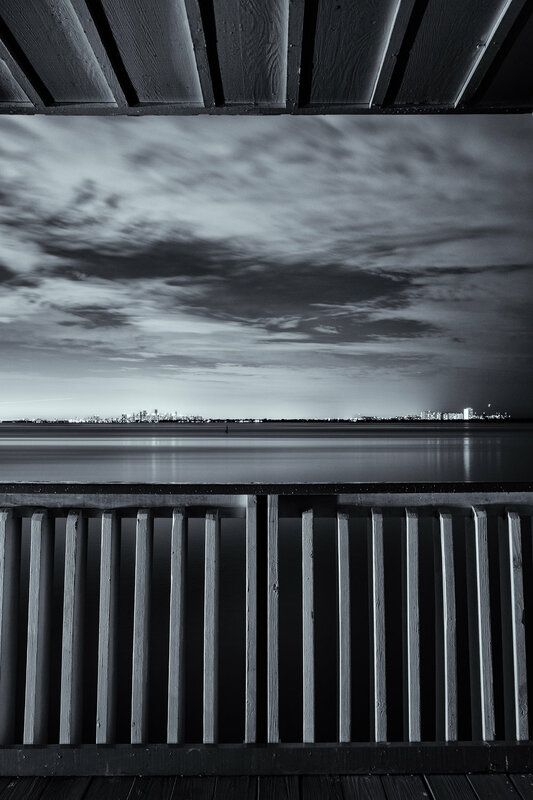 This will be the closest we can see and shoot the Miami skyline and the endless horizon. Eliott and Adams Key. Live your nights on one of the few undeveloped and natural keys in the world. 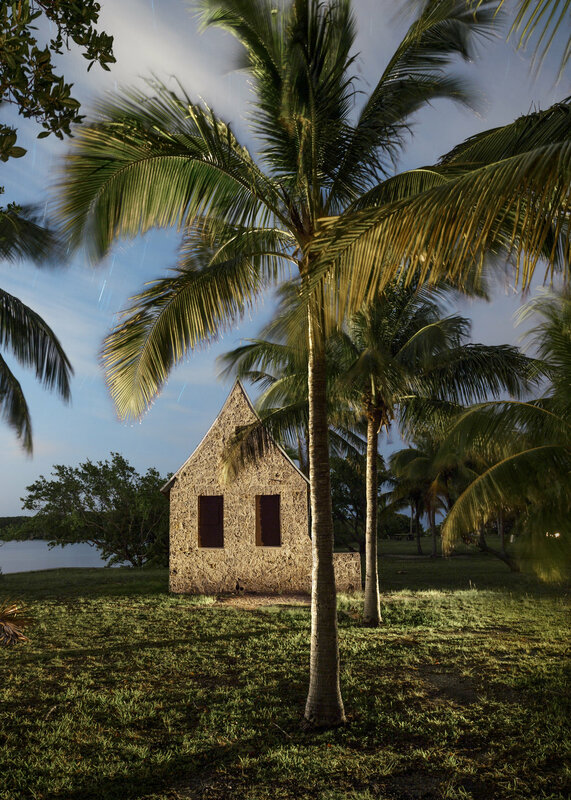 Elliott offers beautiful beaches facing the east and Adams Key has several structures, Cuban refugee chug boats and a recent history of past presidents who visited the long-gone Cocolobo Club. Even though our focus of the workshop will be to explore the park at night, we have built in some downtime for you to tour the many watery aspects of Biscayne: paddle or kayak through the mangroves and lagoons, or snorkel one of the largest coral reefs in the world. We hope to push you to step outside your comfort zone—to test the limits of what you and your camera can do. You’ll go home after the workshop with a solid grasp of many aspects of night photography. The full supermoon will also be a focus and we will try to interpret it in many ways. From detailed close-ups of it rising over the sea to moon trails or beacons in the night. Later in the week, the moon will not rise until 2 to 3 hours after the sun sets, so that will challenge us to capture and create star points and trails, and to add light painting. We will also have the challenge to blend many of our subjects against the distant city lights of Miami. This workshop will have both field and classroom instruction. We will be in the classroom each day, and out in the field at different locations each night. While in the field, the instructors will demonstrate their own techniques, and work with participants one-on-one to make sure everyone gets the most out of the workshop. During classroom sessions, there will be presentations by the instructors, but we will focus on developing your images and sharing everyone's work and ideas with each other. Each day will have a review of the previous night’s work. Miami International Airport (MIA) is the largest and closest airport to our base of operations. The airport is approximately 35 minutes (31 miles) from our hotel in the town of Homestead, Florida. Most of the major rental car companies can be found at Miami International Airport. The workshop will be based in Homestead, Florida, the closest town to the entrance of the park. You are not required to stay at the official workshop hotel, though doing so simplifies logistics and fosters group cohesion. Booking info and a group code will be sent after registering. Night photography tends to disrupt most folks’ normal rhythms. Be prepared to run on a slightly different schedule. We typically find ourselves eating two meals per day—a good breakfast and a great late lunch. When on the night shoots, you may wish to bring snack food or a sandwich, and PLENTY OF WATER. 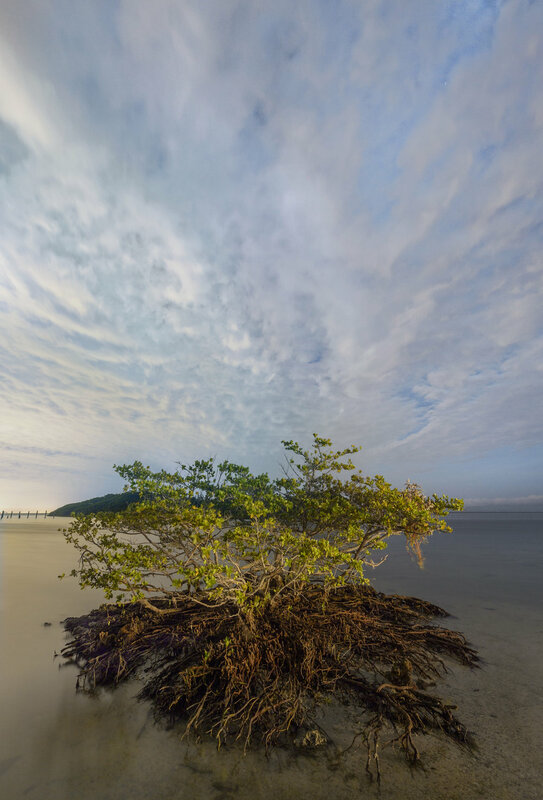 Biscayne National Park’s subtropical climate provides beautiful winter weather. Average daily temperatures for January are 68 F. Typical days are in the mid-70s with nights in the low 60s. Recommended attire: South Florida and the park especially are casual. Comfort should be the first consideration. Although winter in Florida is not considered the buggiest season, consider long-sleeve bug shirts, lightweight pants and a light jacket for our nighttime excursions. We recommend modern synthetics instead of cotton for their fast-drying and moisture-wicking capabilities. This combination of clothing should get you through the week, with the possible occasional need for shorts/swim gear. Flipflops are great for some areas but we recommend you also bring along a good water shoe. This type of footwear allows you to wade into the water, walk over rocks and keep a good grip in the boat. Please reference your favorite weather site for more detailed information on what to expect from winter weather in Biscayne National Park. No vigorous activity will be required, but please consider your physical abilities in hot weather prior to registering. There will not be any long hikes, but you should be comfortable carrying your own equipment over uneven ground in the dark. Boat rides to some of the keys will be a part of the workshop. Although open-ocean sailing will be minimal or non-existent, consider motion sickness remedies if you are prone to queasiness while boating. You might consider packing along a tote bag to carry the extra items you’ll need on the boat and on our shoot locations. We’re thinking bug spray, sunscreen, motion sickness remedies, bottled water, brown bag dinner, and of course your rain coat. Mosquitos frequent many of the keys in Biscayne. Another reason we chose January was because there tends to be notably fewer mosquitoes than in the summer. That being said, we advise bringing bug spray and protective clothing. I first visited Biscayne on a scouting mission to Dry Tortugas. When a national park is on the way, you have to stop and check it out. I really hadn’t heard much about Biscayne except that it was a “water park” and it would be a huge challenge to do night photography there. The visitor center has a boat dock and a meandering mangrove-lined boardwalk that reveals aquamarine waters at all vantage points. I walked into the visitor center to get my passport stamped and met one of the most amazing rangers in the park system. Gary has been working at Biscayne for 22 years and absolutely loves the park. When I told him about our project at National Parks at Night, he was excited to see how his park could be interpreted in a new way and immediately started sharing locations that could be unique for nocturnal capture. Gary was proud to mention that Biscayne would be celebrating its 50th anniversary in 2018—it was established as a national monument in 1968 and then enlarged to 173,000 acres and designated a national park in 1980. After sharing his story of wanting to be a ranger since he was a kid, I knew I wanted to work with Gary and bring awareness to Biscayne with a workshop in 2018. Gary helped me navigate the logistical waters of scouting and organizing a night photography adventure. When I came back to scout with Tim Cooper, we had a solid relationship with the Biscayne National Park Institute, a great group of people who run the educational experiences at the park. Not only do they have a wealth of knowledge of Biscayne Bay, but they all captain the boats that give you the best access. They were also excited to see how their park could be interpreted once the sun sets. We game-planned for several weeks before we sailed into the night. We knew that super-dark skies weren’t going to be an option with Miami shining its lights so close-by. But there is always more to find in the night, and we opted to emphasize what the park represents: pristine aquamarine waters and beautiful blue skies. Match that with the emerald islands and moonlight, and you have a wonderful palette of colors to work with. 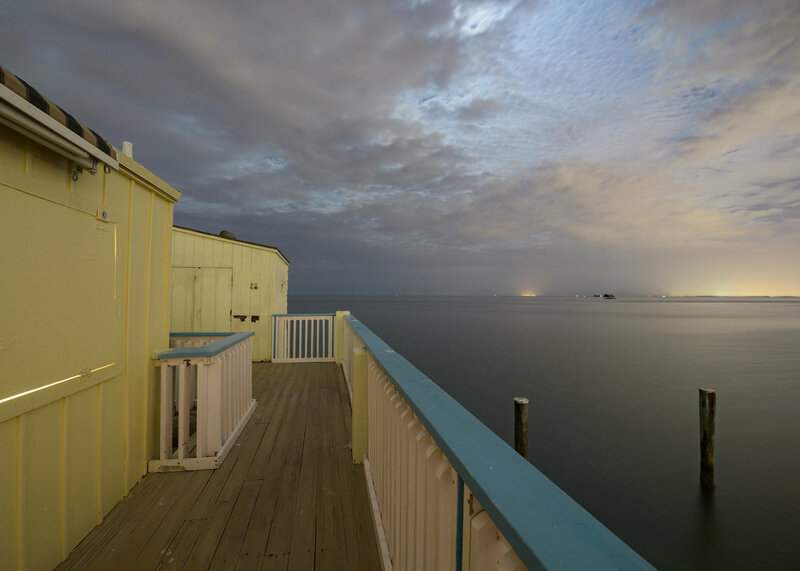 We spent our scouting mission enjoying incredible access and knowledge to Stiltsville. We played these historic but otherworldly buildings off each other with long exposures that made them stand out against the calming colors of a Rothko-esque painting. Boca Chita offered another wonderful example of playing the dichotomy of the man-made versus the night. We were especially drawn to its stunning ornamental lighthouse and chapel built by Honeywell in the 1930s. Almost all the other keys offer opportunities for us to isolate mangroves against the sea-sky and the forever horizon. In the end, we knew this amazing place would be a challenge, but we love the unexpected and pushing those night visions to uncharted places! We are very excited to share this magical place with you.